Can I place an ad on UsedRides.com using FireFox or a MAC computer? Yes! The new UsedRides.com website is now compatible with many browsers and MAC computers. How long will ad my stay on UsedRides.com? All ads automatically expire after 30 days. We do this to assure that the content of UsedRides.com remains fresh - no ads on UsedRides.com are ever older than 30 days, unless they have been re-listed. When an ad expires after 30 days, you will receive an e-mail giving you the option of re-listing the ad and/or editing the ad prior to re-listing it. This is especially helpful if you had pictures with the ad or it was a lengthy ad. When an ad is re-listed it is also re-dated so it appears just like a new ad would. Why does my actual email address not appear in the ad? This is to protect you from Internet "robots" that farm websites for email addresses which it then uses to send junk email to. The new UsedRides.com prevents this by allowing buyers and sellers to contact one another via email that is hidden. Must I wait until my ad expires before making another ad for the same equipment and/or can I place multiple ads for the same equipment? Only one ad per piece of equipment is allowed. Once an ad is placed, you must wait the full 90 days before re-creating the ad. You can edit the ad at anytime, but this does not result in a new listing date. Those who repeatedly place duplicate ads will lose privileges on UsedRides.com. This rule is strictly enforced and we encourage individuals to report violators by clicking on the "Help" button to detail the violation. This rule is designed to help everyone by keeping the site from being cluttered with duplications. I had a bad experience with a buyer or seller on UsedRides.com…. Is there anything that UsedRides.com can do to help? Unfortunately, UsedRides.com cannot police the buying and selling practices of users of the site. However, we encourage users with bad experiences to report problems by clicking on the "Help" button and explain the situation. Individuals with a repeat history of dishonest transactions on UsedRides.com will be black listed. I've seen duplicate ads on UsedRides.com. Since these are not allowed, is there anything I should do to keep things fair? We encourage individuals to report violators of any rules by clicking on the "Help" button and provide details of the violation. All rules are designed to make UsedRides.com a better place for everyone. Why is it free to place ads on UsedRides.com? What's the catch and where are the dings? UsedRides.com is free for everyone and there are no hidden fees. 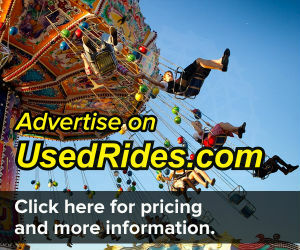 UsedRides.com was created by the leaders in amusement financing as a mechanism to help our customers sell amusement equipment. Our philosophy is simply to assist people in buying amusement equipment and offer our financing services along the way. Why does it take so long for my images to upload? Images which have large dimensions (i.e. : large widths and heights) will take upwards of 2 minutes to upload. It is a good idea to upload images which are of the following: 800x600, 960x600, or 1024x768. If a tree falls in a forest will anyone hear it? Only if someone is standing within earshot. Why are UsedRides.com and the price watermarked on the ad pictures? In the past users have had a LOT of problems with people stealing their pictures and then trying to charge a fee after finding a buyer. These wanna-be brokers are bad for everyone. How do I view just the WANTED ads? How do I search on just WANTED, or just FOOD, or just RIDES, or just GAMES, etc, etc,? First, select the view as whatever category you are trying to search. Then type your search term in the search box and click search. The search will be performed on only the category that you are viewing. How many ads can I place on UsedRides.com? Currently, any user can place up to 10 ads in total. We limit this only to keep companies and brokers from exploting UsedRides.com. Can I place ads for inflatables? No, UsedRides.com is for equipment specific to traveling carnivals only. How can I remove my ad from UsedRides.com? If the item sold, simply log in then click "Edit" on your ad and select the button "Mark Sold". If you need the ad completely removed/deleted from UsedRides.com, click on the "Help" button and ask to have the ad removed. In order to convert your currency to or from USD simply go to Xe.com and use their currency converter.